We've edited Denise's recipe just a little to clarify the instructions. In a large bowl, whisk together the flour, pecans, sugar, baking powder, and salt. Add the buttery sticks or shortening and whisk until the mixture resembles coarse sand. Add the milk beverage and mix quickly with your hands until the dough forms a shaggy ball. Do not overwork the dough. Form the dough into a slightly flattened disk and place it between two sheets of plastic wrap. Using a rolling pin, roll out the dough to form a circle 11 to 12 inches in diameter, by periodically lifting and repositioning the plastic wrap over the dough. Remove the top layer of plastic wrap and invert the dough into a 9-inch deep-dish pie pan. Gently press the dough into the pan. Peel off and discard the plastic. Leave ½ inch of dough hanging over the rim of the pan and remove any excess dough by trimming with kitchen scissors. Turn the overhanging dough under toward the inside of the pan to form a rim. Pinch the dough between your thumb and index finger to form a fluted edge around the top edge of the pan. Put the tofu and eggs in your blender, and blend until creamy, about 2 minutes. Stop to scrape down the sides of the blender, as needed. Add the sugars, molasses, spices, and salt and blend. Add the pumpkin and blend until the mixture is smooth, about 3 minutes. Pour the filling into the prepared pie pan and smooth out the top with a spatula. Place the pie on a cookie sheet and bake for 15 minutes. 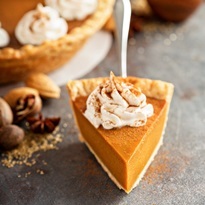 Decrease the oven temperature to 350°F and continue baking for 40 to 45 minutes, or until the crust is golden and the pie is just firm in the center. Place the pie on a wire rack. Lightly press the pecan halves into the hot filling, if using. Let cool to room temperature. The pie can be refrigerated before serving and will firm up more as it chills.